In the early hours of the 10th of October 2015 a fire broke out at a halting site in Carrickmines in South County Dublin. Ten Travellers lost their lives including a young mother who was pregnant. In January 2019 the Dublin Coroner’s Court returned a verdict of death by misadventure in the case of the 10 tragic deaths. Pavee Point issued a press release day calling for new laws for temporary emergency halting sites. Martin Collins, Pavee Point Director, went on RTE Six One News and demanded drastic action be taken to provide decent accommodation for Travellers. The court heard that the Carrickmines site was exempt from fire and planning regulations as it was an emergency temporary site – although it had existed for 8 years. The Coroner’s Court made a six recommendations as a result of what they heard in the court – including a recommendation that powers to establish emergency halting sites be utilised for the shortest time possible. There was widespread outpouring of grief and sympathy for the Traveller families. Thousands of people sent condolences or went to the halting site in Carrickmines bringing flowers. Books of condolences were opened in mayoral offices and many groups around the country organised their own books of condolences. People made donations of food and clothes to the families and the Saint Vincent de Paul co-ordinated a fund to help the Traveller families concerned. Local Traveller organisations gave support to the families in Dun Laoghaire/Rathdown and in Bray offering a place for people to gather to try and come to terms with their grief. 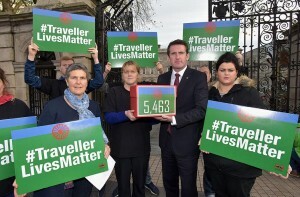 Traveller organisations raised their concerns at overcrowding on Traveller halting sites around the country – due to the lack of provision of Traveller specific accommodation. It became clear from photos of the site that portocabins were situated close together due to lack of space. Dun Laoghaire Rathdown County Council proposed that the now homeless Travellers concerned be accommodated at a Council owned site beside a housing estate at Rockville Drive – a short distance from the site of the fire, on an emergency basis. To the dismay and horror of many people around the country local residents objected to these plans to use the site for Traveller accommodation and blocked access to the site with their cars. Travellers and Traveller organisations were outraged and sickened at this opposition from some residents. Media coverage, particularly on radio, facilitated much racist commentary and remarks on Travellers and Traveller culture. Meanwhile the bereaved Traveller families were forced to stay in hotels while preparing to bury their loved ones. Dun Laoghaire Rathdown County Council entered into negotiations with Rockville Drive residents but on Wednesday 21st of October, while funeral services of the fire victims were ongoing, we learned that Dun Laoghaire Rathdown County Council had given into residents. Instead of a serviced site – the bereaved Traveller families were accommodated at a public car park with no water or sewerage facilities. For many, not only was this a sad outcome but it was also a shocking outcome to a horrible series of events reflecting many of the issues regarding racism and discrimination against Travellers in Ireland today. In the week following the funerals of the fire victims, Minceirs Whiden organised a protest at the outcome of events outside Dáil Eireann and many Travellers and settled people spoke of their anger and outrage at the events. In response to this anger and outrage, and to try and prevent a similar tragedy ever occurring again, Pavee Point organised an online petition demanding urgent action from An Taoiseach Enda Kenny, TD. We said a Traveller Agency was needed to drive policy implementation across accommodation, health, employment and education. Five thousand five hundred people signed our petition which was run over three weeks and we delivered this to the Taoiseach at Dáil Eireann on the 11th November. We should never forget the victims of this tragic fire: Tara Gilbert (27) and her partner Jimmy Lynch (25), their daughters Jodie (9) and Kelsey (4) and Willy Lynch (39); Thomas Connors and his wife Sylvia (both 27) and their children Jimmy (5), Christy (2) and Mary (five months).